Change is being led by a transformation on the digital front. Pavan Lall reports. For close to a century, almost every urban Indian male had his first suit, or jacket tailored at one company -- Raymond. But over the last decade, the proliferation of both custom-tailored brands and off the rack options or what some call "the Zara-fication of fashion" has pushed the brand off the default list for many. And that is triggering a rethink on the brand's future role and positioning in the rapidly evolving universe of Indian male fashion. In some part, change is being led by an organisational transformation on the digital front and being pushed through by a team of about 40 executives out of the company's Thane, Mahrashtra, office. Uma Talreja, the company's first chief digital officer, says the journey began by first learning what consumers have to say. "We have a centralised system where we capture feedback on our tailoring (service), what is wanted, not wanted." The system already has around 1,300 users from which the company harvests data through a Litmus software system. That universe didn't exist before the system was set up. Talreja, who originally joined Raymond as head of strategy two-and-a-half years ago, then took over the reins of the digital team. Since then, the company and its partners have invested around ₹450 million every year toward digital initiatives. That data comes from all their stores (owned and franchised ones) from a common point-of-sales (POS) system that streams information. There's also a common SAP, so everyone's sales data and inventory sits in the same place, and a customer relationship management (CRM) platform underpins it all. That means unlike 10 years ago, the company now has access to live consumer data, which is driving decisions and that's the biggest shift. For example, accessories. "We are soon going to be launching 3D printed cufflinks, tie and lapel pins. Raymond is moving towards being a solutions provider as against a company that just makes clothes," Talreja says, adding that other services include an online tailoring service that's been pilot launched in Bombay and Pune. "So tailoring, as a service influences the fabric category and an online concierge service, is essentially letting you call a tailor home or to a location of your preference by an appointment." Ashish Bhasin, chairman and CEO of media and ad firm Dentsu Aegis Network, who has 1,600 of his 3,500 people working on digital business areas says the key to digital reinvention of brands is knowing what and how the customer wants and behaves. "If I had to buy a movie earlier, I would see an ad in the papers and get someone to pick the tickets, but if my son perhaps wants to see a movie he may notice it in the paper's online version and then either stream it or buy or watch it online." Digital is divided into two broad categories -- search, performance and e-commerce and then branding. The difference is that the first category leads to actual sales. Cars are an example where digital research is done and the large part of the journey happens online. In India, the digital channels and corporate digital strategies are being influenced also by the fact that the majority of Indian consumers are using the mobile phone as their first point of access. "India has moved from mobile first to mobile only," Bhasin says. "Of every 100 consumers, 95 come in on mobile." Even so, any business model change is fairly fundamental and it is hard to change an existing one, says Jaspreet Bindra, senior vice president of digital transformation at the Mahindra Group. He adds that it's easier to augment it through a start-up-styled business unit that works in tandem. 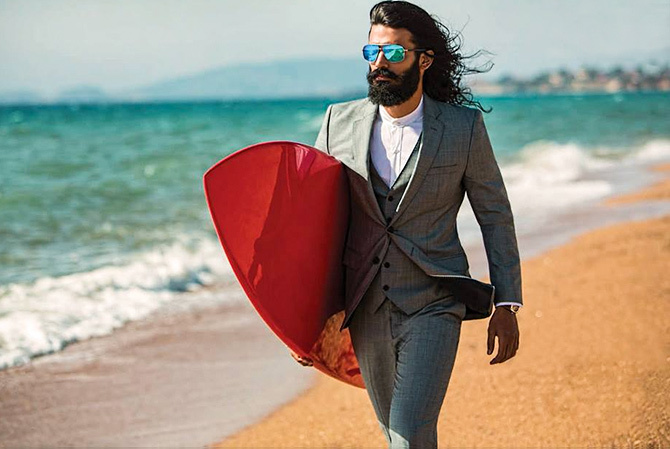 "So, for a customer who wants to stitch a suit by his existing tailor, but with a fabric that is made by another company, that could be made possible on an open platform that's run by the existing company's digital unit," Bindra explains. For that to happen there would have to be a big shift in the way brands think about their digital properties though. Bhasin says there are two big challenges for digital marketers. The first is that there are no ratings standards for digital, such as an IRS for newspapers or a BARC for TV. "No agreed upon industry norms for digital impact measurement," Bhasin says. "The other is the noise about the legitimacy and transparency of online channels, and the demise of large tech unicorns is as rapid as their rise, so one has to be mindful." While there are twists and turns in the digital journey for companies such as Raymond, there is little doubt that digital is where all big brand transformations are likely to be located. Here's a future scenario. In five years will a customer be able to send out a message that says "Premium cotton black formal shirt" from a smartphone to an integrated Raymond website, which will drill down to a connected platform and update physical measurements on the fly to process an order that has the shirt delivered to the customer in a few days. "I think we may well see that happen, perhaps even sooner," Talreja says.